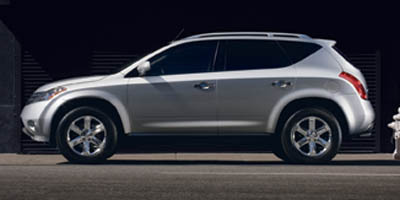 Nissan Murano AWD, options include: Keyless Entry, Steering Wheel Audio Controls, Aluminum Wheels, a Continuously Variable Transmission, Power Windows, All Wheel Drive, Multi-zone Climate Control, Automatic Climate Control, Cloth Seats, Power Mirrors, Power Locks, Brake Assist, Steering Wheel Controls, a Power Drivers Seat, a Leather Wrapped Steering Wheel, a Driver Illuminated Vanity Mirror, Cruise Control, Tinted Glass, Air Conditioning, a Pass-Through Rear Seat, Rear Reading Lamps, a Gasoline Engine, Bucket Seats, Privacy Glass, Anti-Lock Brakes, a Rear Head Air Bag, an AM/FM Stereo, an Adjustable Steering Wheel, a Drivers Air Bag, Disc Brakes, an Auxiliary Power Outlet, Child Proof Locks, a Passenger Air Bag Sensor, a Front Side Air Bags, a Passenger Illuminated Visor Mirror, a Front Head Air Bag, a Single-Disc CD Player, Intermittent Wipers, a Spoiler / Ground Effects, Variable Speed Intermittent Wipers, a Rear Window Defroster, Power Steering, a Reading Light(s), a Spare Tire (Small Size), a Tilt Steering Wheel, Vanity Mirrors, and a Passenger Air Bag. This 2006 Nissan Murano AWD SL, Stock number 8575 has a Merlot Pearl exterior with 112,471 miles. Equipped with an impressive 6cyl, 3.5l, 245.0hp engine, an xtronic continuously variable automatic transmission and all wheel drive, this Nissan Murano AWD is ready to conquer the roads! Contact us today to schedule a test drive of this 2006 Nissan Murano AWD SL! Or stop in at 520 East Main Whiteland, IN to check it out in person! This awe-inspiring vehicle as well has Multi-Zone Climate Control, Keyless Entry, and Steering Wheel Audio Controls. This awe-inspiring vehicle as well has Steering Wheel Controls to help keep you safer on the road, an Auxiliary Power Outlet, and Single-Disc CD Changer.